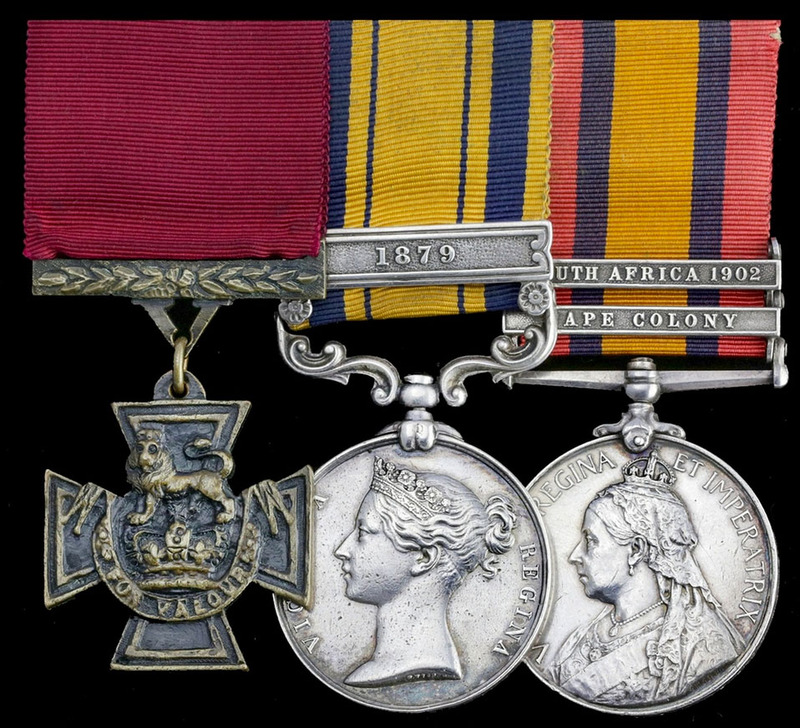 A Victoria Cross and South Africa Medal, clasp 1879, purchased by Lieutenant-Colonel H. F. N. Jourdain at Sotheby's for £42 in 1906, today reside in the collection of the National Army Museum, Chelsea, London. The replica V.C. and South Africa Medal, clasp, 1879, and original Boer War Medal, as described above, were worn by Fitzpatrick from the early 1900s up until his death in 1933, when he bequeathed them to the first member of his family to serve in the armed forces. Some confusion reigns as to who that was - probably a great nephew - but more certain is the fact that they were sold to a dealer, Joseph Kavanagh of Smithfield, Belfast, in November 1950. He, in turn, sold them to Alderman Malcolm Mercer, who loaned them to the Belfast Museum. Resultant newspaper reports reached Lieutenant-Colonel Jourdain, who argued that the awards in question - excluding the Queen's South Africa Medal - were replicas. The Alderman, having obtained a professional opinion as to authenticity, was disappointed to learn that the Colonel's suspicions were correct. As a consequence, he withdrew the awards from the Belfast Museum and obtained a refund from Mr. Kavanagh. Francis Fitzpatrick was born at Clontibret, Co. Monaghan, Ireland in 1859, the son of James and Margaret Fitzpatrick, and enlisted in the 94th Regiment at Newry in 1876. It took three hours - at a cost of British casualties of 13 killed and 35 wounded - for the stronghold to be overrun. Both Fitzpatrick and Flawn were presented with their V.C.s by Lieutenant-Colonel Philip Anstruther, commanding the 94th Regiment, at Lydenburg in the Transvaal on 17 September 1880. Both, too, went on to see action at Bronkhurst Spruit in the First Anglo-Boer War in 1881, where they were taken prisoner. Fitzpatrick was wounded and left for dead and, it is said, had his V.C. taken by another soldier on the same occasion. He was issued with an official replacement in June 1881, about the time the 94th Regiment was re-mustered as the 2nd Battalion of the Connaught Rangers. Fitzpatrick, who returned to England in 1882, subsequently transferred to the Duke of Cornwall's Light Infantry and was discharged in May 1888. At the outbreak of the Second Anglo-Boer War, after he is said to have fallen on hard times working as a groom in Malta, he enlisted in the 3rd Battalion, Argyll & Sutherland Highlanders, and saw further active service in Cape Colony (Medal & 2 clasps). Fitzpatrick, who had married Esther (nee Breen), a Glasgow girl, settled in the city on taking his discharge in 1902 and found employment as a Post Office doorkeeper. He died at 49 Blysthwood Street, Glasgow on 13 July 1933, aged 74 years, and was buried in an unmarked grave at Kentigern's Cemetery. Fitzpatrick's group hammered at £15,000. Still a very tangible link to a brave act and a gallant man. djb wrote: Fitzpatrick's group hammered at £15,000.